TEST YOURSELF: CAN YOU IDENTIFY THESE FAMOUS AMERICAN WOMEN WRITERS? Q: What did you learn from your 2012 summer intern work at the American Women Writers National Museum, Washington, D.C.? 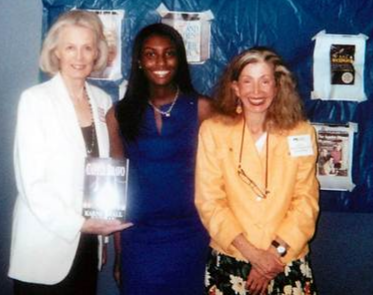 AWWNM's 2012 summer intern Jadee Pope (center) helped AWWNM founder Janice Law (right) by writing and researching data for the 50-state Project. Pope, a University of Michigan student going into her junior year, gave the July presentation of the 50-state project, showcasing Mississippi, Missouri, Montana and Nebraska women writers. Pope also assisted with research on women Pulitzer winners. Author Karna Bodman, left, a June panelist--and Law--are University of Michigan alumnae.